Ayamonte, in my mind, has a touch of good and a smear of bad. On one hand, my dear friend Meag lived there for a year, and it’s impossible to think of the small city that shares a border with Portugal and not burst into giggles. But then again, I was once stuck there during a holiday when my bus to Faro was late, and I missed the last one to leave for Seville. Still, reader Jill contacted me about sharing pictures of this seaside village, and I was happy to oblige. 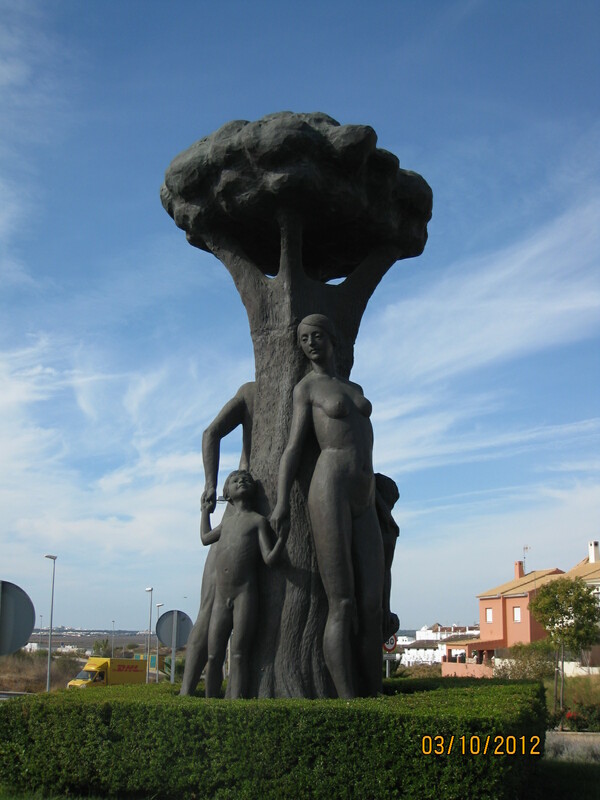 For a sleepy city, Ayamonte’s art patronage stands out. Ayamonte is situated on the river Guadiana, which marks the border between Spain and Portugal. Historically it was of strategic importance and has always been associated with fishing and seafaring. The last twenty years have seen a growth in tourism, but it is often still dismissed as the end of nowhere! However, nothing could be further from the truth. The Ayamontinos have a great loyalty to their town and its culture and traditions, from the devotion of Semana Santa, to the Music Festival in August and the patronal festival in September. It is a town where artists and sculptors have flourished. Even Joaquin Sorolla painted one of the fourteen panels commissioned for the Hispanic Society of America in Ayamonte, entitled La Pesca de Atun. 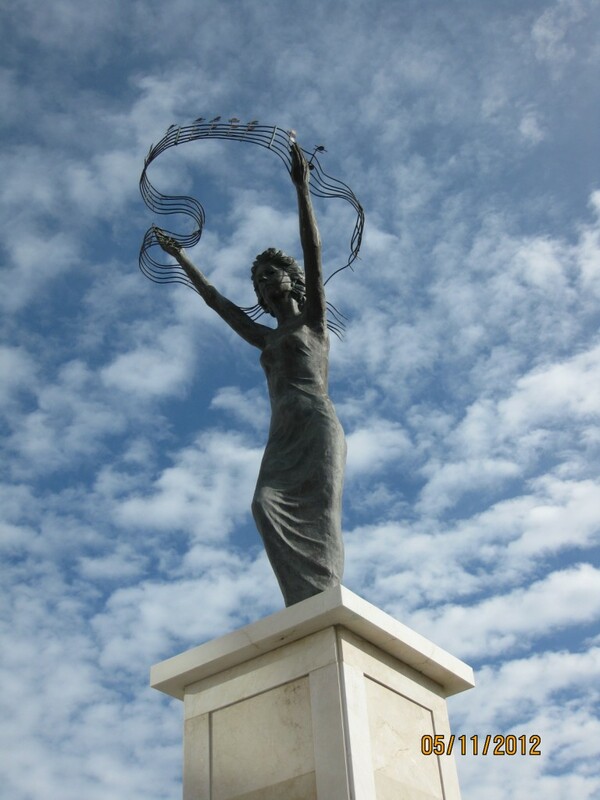 What has fascinated me about the artistic life of the town are the sculptures on roundabouts and in the squares. These are mainly modern, commissioned as part of the expansion and restoration of the town, but commemorating the history and traditions of the location. Statues associated with the past life of the town are those which remember the water carriers, the lime manufacturers and the fish conservers. Before the arrival of piped water the water carriers delivered fresh water. The ‘caleros’ manufactured and transported the lime used to make the whitewash for the typical white buildings. Fish preserving was almost exclusively the domain of women, and still exists today on a much reduced scale on a modern industrial estate. The association with sea faring is commemorated by a statue of sailors who joined Columbus’s voyage to the New World. Additionally there exists a statue of women awaiting the return of the fishing boats, though currently being restored after being damaged. 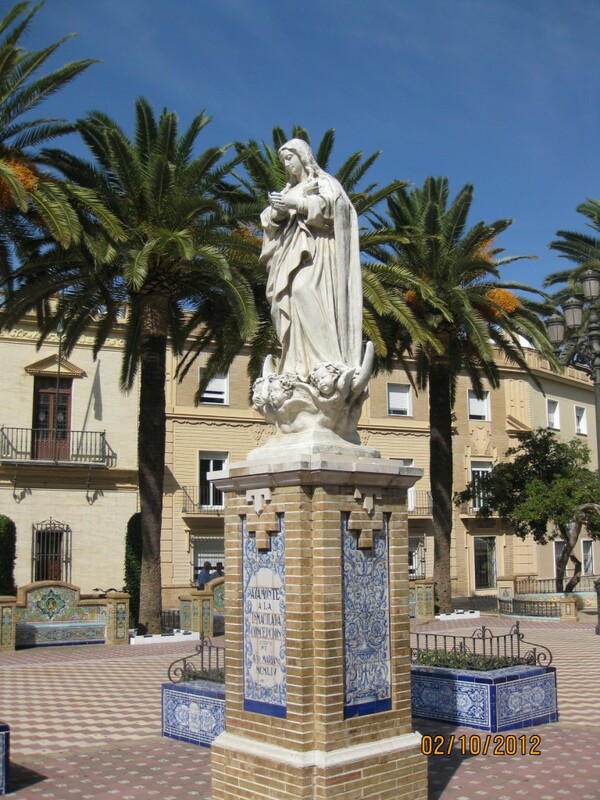 There are also religious statues prominent in the main square and park, as one would find in every Spanish town. Religious statuary is seen at its most historic and elaborate during Holy Week, when the statues – often the work of well known sculptors of the past – are carried through the town on the ‘pasos’. 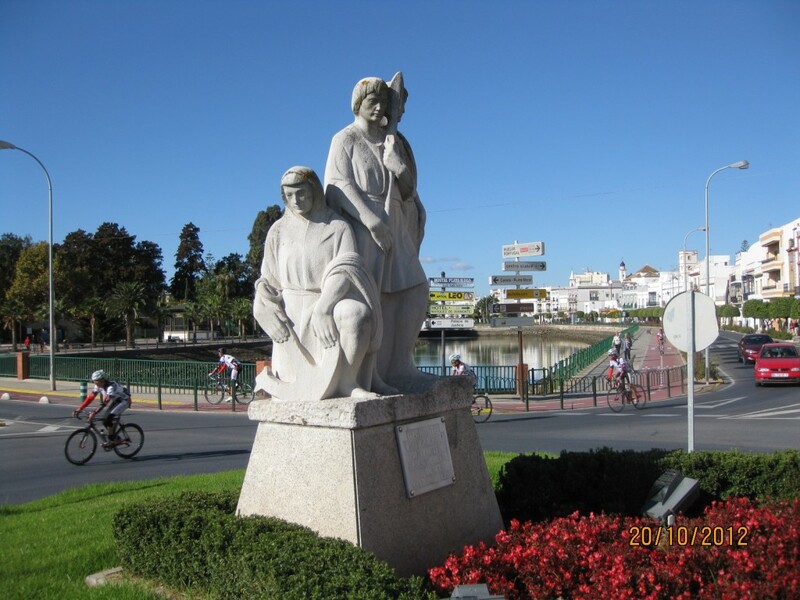 Ayamonte even claims Santa Ángela de la Cruz as one of its own, as she founded a house of the Sisters of the Cross in the town in the late 1870’s and she too has her statue. Much broader concepts are celebrated too, such as the family and music. I hope you have enjoyed this tour of the public art of the town, and will visit one day, when the red roses are in bloom to welcome you. Jill is a retired teacher who lives part of the year in England and part in Ayamonte, Spain, as well as enjoying travel. Catch up with her on twitter, @mumjilly. If you’ve got photos to share of Southern Spain, please send them to sunshineandsiestas @ gmail . com, and check out my Facebook page for more of Andalusia and beyond. These are some awesome statues! I especially like the tiles underneath the saint. Also this is kind of random and I promise I wasn’t being a stalker. I was going through my friend’s facebook album of her recent travels in Spain with her novio and I realized you also know her when I saw you had left a coment on one of her pictures! I put two and two together-my friend also did the auxiliar program in Sevilla for 2 years so I’m assuming that’s how you met her. She is now living outside of Madrid with her Spanish novio teaching English with the same program I was doing (not the ministry). I met KA doing my master’s at nyu-small world! It’s ok, I stalk KA from time to time! I met her our first year here in Seville, and I nearly did the Middlebury master’s the year she did the NYU one. Our paths nearly crossed! I miss Ayamonte so much!! Hey you! How are you adjusting to life back on the West Coast? It hasn’t been easy, but I’m slowing getting my new life put together while longing to be in a warmer climate. I’m teaching Spanish, which I like much better than teaching the English.. I still miss Spain all the days though! I LOVE Ayamonte, and it wasn’t that many years ago that hardly no one spoke English and there were no English translations of menus, which made it a lot more interesting and authentic. However, even though there are now loads of expats there it still retains it’s Spanish feel and is a true “working” town. We visit a lot as my in-laws live in Portugal, and one of my favourite memories is being in the main square at midnight with my then four year old; it was full of Spanish famillies of all generations and my daughter played football, catch etc with the kids for hours without a word of Spanish except Hola! Ah, happy days and thanks for the reminder. Funny you should mention Portugal, as that was my only reason for every getting to Ayamonte! Thanks for visiting, Melanie. I hadn’t heard of Ayamonte until I read this post. Wish I’d known about it when I was in Tavira recently, but we had no plans to travel further to Spain. It definitely looks like a wonderful place to visit and I hope to get there when we return (to either Portugal or Spain). I love discovering the mostly unknown places and especially places that celebrate their history and art. Looks like Ayamonte does both I love that first photo; a celebration of Music? ?